Becoming a Chiropractor was a way that I could help others but it is also my way of life. I lead by example and my family and I lead a healthy life by looking after ourselves; eating healthy, exercising regularly, reducing/ managing our stress levels and getting our spines checked regularly. If other people knew how important a healthy spine and nervous system was then they would be getting checked regularly too! 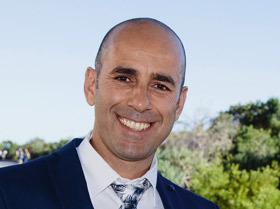 I graduated from Macquarie University in Sydney with a Master of Chiropractic in 1996, after having obtained a bachelor of science with a major of pathology, physiology and anatomy, and practiced in Australia for 6 years. Moving further abroad, I have practiced in Italy for the past 9 years where together with my wife, Maria, we built one of the largest chiropractic clinics in all of Europe. I currently maintain 3 chiropractic clinics which service the community of Northern Italy. My most important educational experience, however, has come from my patients. 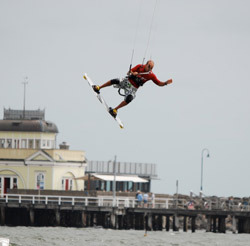 National Kitesurfing freestyle championships. Dr Mario ranked second in the Masters category. I have seen chiropractic care help people in developing nations, in countries where chiropractic is illegal, and where chiropractic is fully licensed and recognised. Chiropractic care helps everyone regardless of the political situation and improves one’s quality of life. Chiropractic care is for everyone. I like to encourage people to get checked sooner rather than later. It is not a matter of how many years in your life, but how much life there is in your years. I firmly believe in clearly explaining what patients need… and happily give them exactly what they want. When it comes to chiropractic my job is clear, keep your nervous system free from interference so your body can express its inner potential. I am bilingual, I speak fluent English and Italian and having spent the last 9 years in Italy it is a pleasure to be back home but still use my language skills to better serve my patients. We love life, sport and are into all things healthy. Maria is a passionate runner and kite surfer, Vegas, our 5 year old, is just learning and I ranked second at the Australian National Kite-surfing Free Style championships (Master’s 2010). I Truly Believe in All Things Natural. I enjoy regular exercise and often cycle to work and/or go for a run at lunch. My wife Maria is a Health and Wellness coach and helps people achieve more out of life if that is what they want. We have 3 young boys and we have chosen not to get any of them vaccinated opting for a natural lifestyle, my family has regular chiropractic adjustments. I don’t tell anyone what to do, I just suggest people do their own due diligence these are our choices. I chose the area of West Lakes to open our first practice because there are chiropractors nearby and that means I can go and get adjusted when I need it to ensure I am also looking after myself and therefore performing at my best. Now also practicing from our Back by the Beach Chiropractic Centre location, I can serve the broader communities of West Lakes, Port Adelaide, Semaphore and Royal Park. I believe that my service combined with our modern offices and convenience makes Back by the Beach Chiropractic Centre your number 1 choice in health care. Chiropractic is for everybody and chiropractic should be affordable for everybody. We don’t refuse people care if they need it. If people are committed to improving their health and doing what it takes to get healthier then we are happy to help and here to help. Contact Back by the Beach Chiropractic Centre for a visit today.